WASHINGTON—Despite complete compliance by Iran with all its treaty obligations, President Donald J. Trump announced in early May that he was pulling the United States out of the Joint Comprehensive Plan of Action (JCPOA, the nuclear deal among Iran and the five UN Security Council members—the U.S., U.K. France, Russia, and China—plus Germany) and that the U.S. would reimpose sanctions on the Islamic Republic. European nations were left scrambling to save the landmark agreement, finalized in 2015. “We have also consulted with our friends from across the Middle East. We are unified in our understanding of the threat and in our conviction that Iran must never acquire a nuclear weapon,” the president said in a televised, prime-time address. “After these consultations, it is clear to me that we cannot prevent an Iranian nuclear bomb, under the decaying and rotten structure of the current agreement. 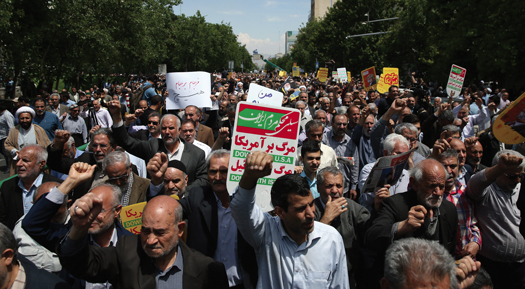 The Iran deal is defective at its core. If we do nothing, we know exactly what will happen. In just a short period of time, the world’s leading state sponsor of terror will be on the cusp of acquiring the world’s most dangerous weapon. Therefore, I am announcing today that the United States will withdraw from the Iran nuclear deal,” Mr. Trump said May 8. Iranian President Hassan Rouhani responded by saying Iran would continue to abide by the agreement and would not renew its nuclear program for now. Elsewhere, condemnation was swift. Only Israel and Saudi Arabia applauded Mr. Trump’s decision. “The nuclear deal with Iran is the culmination of 12 years of diplomacy. It belongs to the entire international community. It has been working, and it is delivering on its goal, which is guaranteeing that Iran doesn’t develop nuclear weapons,” Federica Mogherini, top diplomat in the European Union told members, according to broadcast reports. “The reality is clear. The JCPOA is working—that is a view shared by our European allies, independent experts, and the current U.S. Secretary of Defense,” former President Barack Obama said in a statement. “The JCPOA is a model for what diplomacy can accomplish—its inspections and verification regime is precisely what the United States should be working to put in place with North Korea. Indeed, at a time when we are all rooting for diplomacy with North Korea to succeed, walking away from the JCPOA risks losing a deal that accomplishes—with Iran—the very outcome that we are pursuing with the North Koreans. “That is why today’s announcement is so misguided. Walking away from the JCPOA turns our back on America’s closest allies, and an agreement that our country’s leading diplomats, scientists, and intelligence professionals negotiated,” Mr. Obama said. The decision is being compared to the choice after the 9/11 attacks, to invade Iraq, that is, it was drafted from the Israeli playbook, wrote Patrick Wintour, Diplomatic Editor for The Guardian. “Trump’s emphatic rejection of the deal this week was Israel’s dream moment, according to one European diplomat. “The question now is whether Israel and the US are acting in concert, with Washington applying the economic pressure through sanctions and Israel the military pressure through airstrikes. Some diplomats hope these are mere skirmishes born of the tension in the region, and not part of a secret strategy,” Mr. Wintour said of the missile exchanges between Iranian forces in Syria, and Israeli troops occupying the Golan Heights. Most Western observers are not afraid that war is imminent however. “After closely interrogating everybody I could find in the White House, I would say that there is no enthusiasm in the United States for a military option, and there is no such plan,” UK foreign secretary Boris Johnson told Members of Parliament after returning from a last ditch effort to persuade Mr. Trump to keep the deal with Iran. “I don’t think it means war right now,” Medea Benjamin, co-founder of CODE PINK Women for Peace told this writer. “The sanctions that the U.S. put in are going to kick in, in the next three to six months. And so there is some time to negotiate more with the Europeans, and the Russians, and the Chinese. “I don’t think” war is imminent, retired Army Col. Ann Wright told this writer in an interview. “First, I don’t think the U.S. military wants to take on the Iranian military. The United States usually attacks little countries, with less than 25 million people. Iran has 80 million people. It has a military that has ballistic missiles. It has a military that has a lot of recent experience in Syria. I don’t think our military at all, wants to have any confrontation with Iran. “So, I think in the Pentagon, there’s great consternation about the United States having any sort of a military confrontation with Iran,” said Col. Wright. 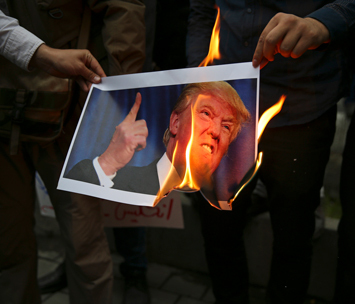 There is little consensus in favor of Mr. Trump’s decision regarding the Iranian nuclear deal. “I don’t think it’s wise. I don’t think it’s practical, and I feel will not be productive, and I’m more fearful that it might be counter-productive,” Edward Peck, retired U.S. Ambassador to Iraq told this writer of the decision to abandon the nuclear deal. “I have a feeling that President Trump does not have the in-depth appreciation for what international relations and diplomacy are all about, because that particular agreement was reached by a conglomeration of countries, all the other ones, including Iran, were agreeable. “The experts appeared to be convinced as a group that the rules were being followed by the Iranians, and so I’m not sure why the U.S. backed out of it. I just don’t think that’s going to be to our benefit, and could easily become a seriously negative actor in that part of the world as well as elsewhere,” said Ambassador Peck. “I could be wrong. I hope I am. But on the basis of my experience in that part of the world and all of the others involved and the issues on which they are focused, I think that that was not a well calculated decision. I know that a lot of people will not agree with me. The future will tell us, who is closer to being to the truth in the final analysis. I hope I’m wrong, but I’m very much afraid,” said Ambassador Peck. “With 16 years in the U.S. State Department, and 29 years in the U.S. Army and Army Reserves,” Col. Wright said, “I feel that the decision by the president to take us out of the agreement with Iran and the other partners—from Europe, Russia, China—is a very misguided and dangerous decision for him to make. “I feel it is undercutting, credibility of course of the United States, there’s not much remaining. And it makes the world more dangerous, in that Iran had complied with everything the agreement had asked for, and then when you look forward to what the Trump administration is going to be doing in the next couple of weeks with the Republic of North Korea, then how in the world can the North Koreans believe anything the U.S. government does, when it backs out of this kind of agreement?” said Col. Wright. “And then the other thing I think it means is that it’s now even more important that the South Koreans continues with their brilliant diplomacy, so that no matter what, there can still be a peace treaty between the North and the South,” said Ms. Benjamin.